Space travel has been abandoned in the twenty-second century. It is deemed too dangerous, expensive, and inconvenient�and now the all-powerful Fishhook company holds the monopoly on interstellar exploration for commercial gain. Their secret is the use of �parries,� human beings with the remarkable telepathic ability to expand their minds throughout the universe. On what should have been a routine assignment, however, loyal Fishhook employee Shepherd Blaine is inadvertently implanted with a copy of an alien consciousness, becoming something more than human. Now he�s a company pariah, forced to flee the safe confines of the Fishhook complex. But the world he escapes into is not a safe sanctuary; Its people have been taught to hate and fear his parapsychological gift�and there is nowhere on Earth, or elsewhere, for Shepherd Blaine to hide. 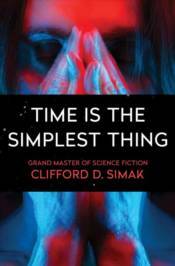 A Hugo Award nominee, Time Is the Simplest Thing showcases the enormous talents of one of the true greats of twentieth-century science fiction. This richly imagined tale of prejudice, corporate greed, oppression, and, ultimately, transcendence stands tall among Simak�s most enduring works.